Causes: When using the IdP, you can accomplish this by using the Global Aux ID field in the data tab, and when trying to map this value via Radius, nothing is passed over. There is a bug on the Radius server that does not read the Global Aux ID field in the data tab. 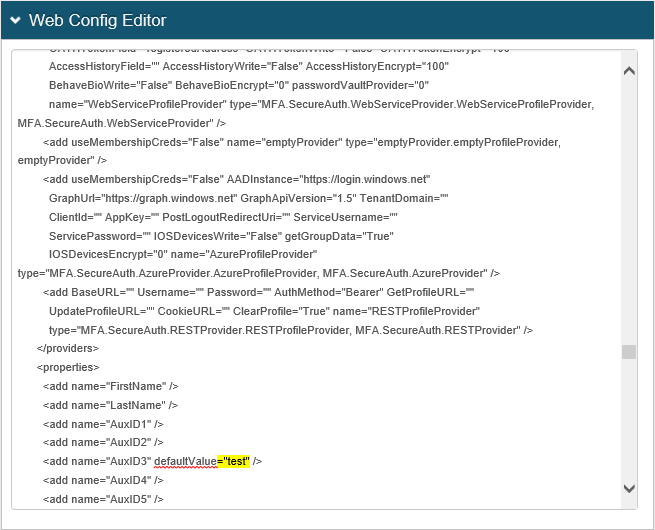 Resolution: Pick a AuxID value field that is currently not being used, and hard code a value in it via webconfig. As you can see from the screenshot below, I hardcoded a value "test" in AuxID3. To do this just, add 'defaultValue="whatever_value" before the closing />. Make sure to add this to the Data Attribute Mapping on the RADIUS clients settings and map it to the RADIUS Attribute that is needed for the configuration.